Love the watch. Very beautiful. Already received many compliments on the beauty of the watch. My mom loved this watch. Especially the diamond dial detail. She was looking for something inexpensive, matched her style and good enough to wear every day. For her, this watch was it. Thank you Overstock! It is simply stunning! This is my new favorite gold watch. I was surprised at how absolutely beautiful it was when it came in, plus, it was an excellent value. Have a very small wrist and watch did not fit properly. 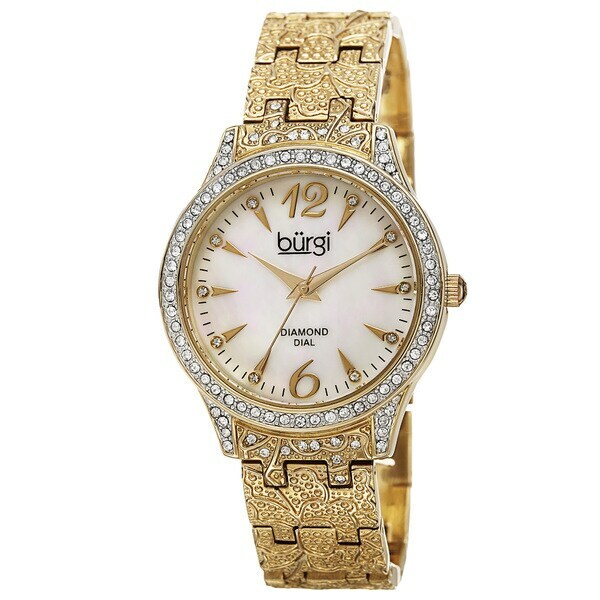 The perfect watch for my Mother! Absolutely beautiful! Loved it so much that I purchased one for myself! An incredible stylish watch! This watch is excellent. It has a chic exspensive look. IT'S WORTH THE MONEY. "Can the band be sized smaller? " Yes, the links on the band are removable. I just love the look of this watch. I need a gold watch to replace one that has worn out, and this is the only one out of about 400 that I looked at that has the look of grace, durability, and sophistication all in one piece.